Harvest Moon Grille is a unique eatery in downtown Lincolnton that is such a breath of fresh air. Their website says “an adventure in freshly foraged foods” and it is an adventure. The menu is different each time I visit. This is because they are farmers themselves, and build the menu off of what is currently available for harvest in their own and other local farms. And they make EVERYTHING…they make their breads, their soups, their sauces, their stocks, their dressings and their desserts. They even have a shelf for locally made products to take home with you. In addition to that, they cater: at their place, on site or boxed lunches for picnics lakeside. If you’d like to learn from these tremendous chefs, they also offer Saturday classes which include lunch! They offer breakfast and lunch, both available from open to close. You can also get dinner on Friday and Saturday nights. On the day we visited my son got breakfast and I got lunch. The dining room is smallish, but you feel cozy, not cramped. The walls are filled with art from local artists. If the weather is nice, you should opt to eat outside on the patio. They have a very comfortable patio overlooking Main Street. We opted for a locally crafted soda made in Waynesville, NC. The Raspberry Cream was fizzy with just the right amount of sweet. It’s the best. I love how they are served with a mason jar full of ice. This is the child’s portion (Junior) of French Toast. He said it was delicious! I had a falafel sandwich and a cup of tomato soup. The brioche bun that the sandwich came on was made fresh in house and was out of this world delicious. The falafel was a tiny bit loose for my liking, so ended up being too messy for me. The bitter greens brought a peppery element to the dish and the cucumber sauce (tzatziki) was tangy and cool. I have to say, the smallest detail was my favorite. The house-made pickles were perfect. Just pickled enough to be tasty, but still had a fresh taste. These chefs really know their way around the kitchen. The tomato soup (served in a little mason jar!!) was also fresh and homemade. It didn’t taste like Campbell’s, didn’t taste like it came from a bag (I’m looking at you, Fatz) it tasted like it was made from my grandmother’s canned tomatoes. The drizzle of olive oil on top gave it a richness so it didn’t need cream. 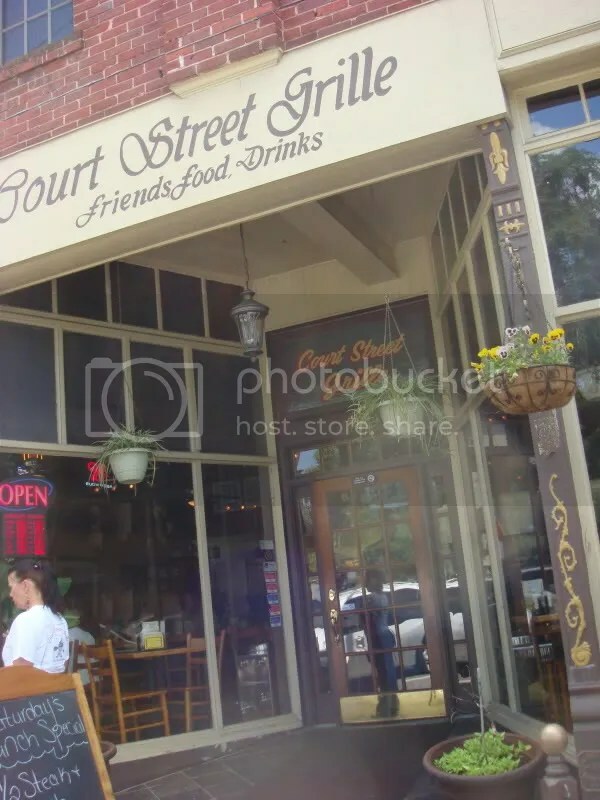 Court Street is one of our favorite restaurants in Lincolnton. Located on the court square, it is a popular destination for the white collar lunch crowd. But, don’t let that dissuade you, this place is popular with everyone! The offerings include sandwiches, Italian standards, pizza, salads and wraps. Everything is very fresh and homemade. The owner’s mom makes a homemade cake(s) daily, and when it is gone, it’s gone. So, get there at lunch and get a piece! On this visit I had the Italian Sandwich platter. 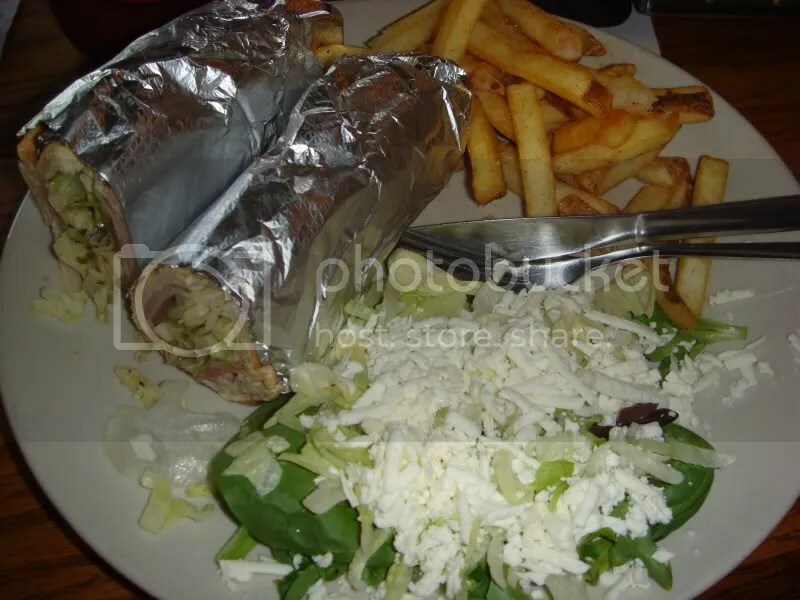 They wrap all of their sandwiches in foil and serve them warm. 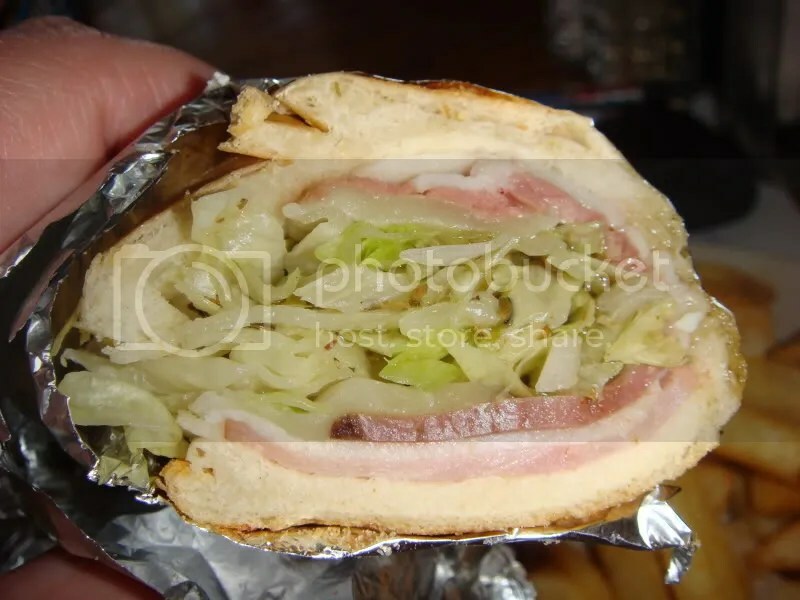 As you can see by the cross section I’ve provided, the Italian sandwich is filled with ham, mortadella (bologna? ), cheese, lettuce, tomato and dressing. As you can see, I opted for no tomatoes. The platters themselves come with french fries and a small side salad. The french fries are crisp and covered with seasoned salt. For the salad, you have your choice of mesculan mix, iceberg lettuce or a mix. I find the mix to be the best choice. Their dressings are homemade (at least the house Italian and the Ranch) and the salads come with tomatoes and a large helping of cheese, which for me turned out to be too much for the amount of lettuce. I’m probably in the minority there. The variety of sandwiches there is pretty flavorful. Some of my favorites include the buffalo chicken wrap, and the chicken sandwich with Osama’s (that’s the owner) specially seasoned chicken. All are served dressed the same way mine is. I’ve also asked them to make my daughter a “pizza sub” with pepperoni, cheese and sauce (not on the menu) and they happily obliged. Now, if you have picky children who wouldn’t dream of eating a sandwhich with all of that “stuff” on it, try the chicken fingers off of the appetizer menu. 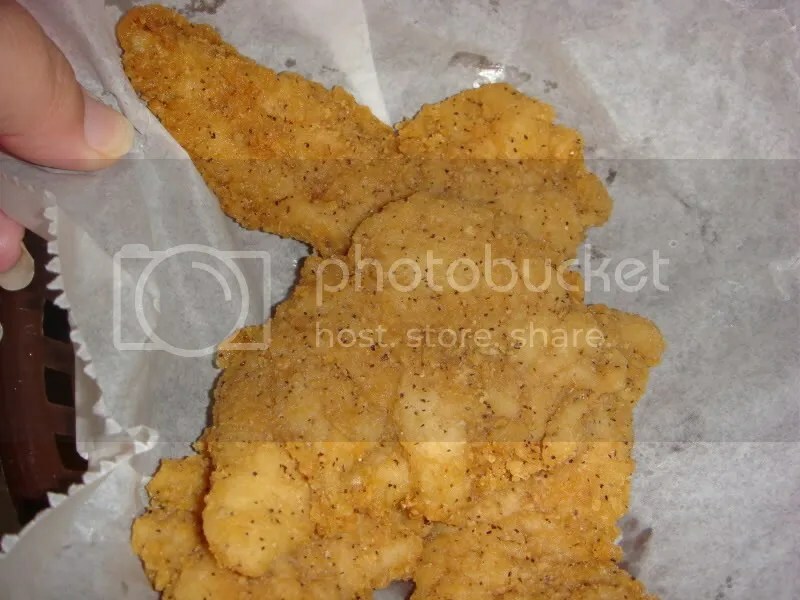 Yep, they are pretty basic, but you can see the pepper flakes in the breading, so that counts for something. My son was thrilled with them. 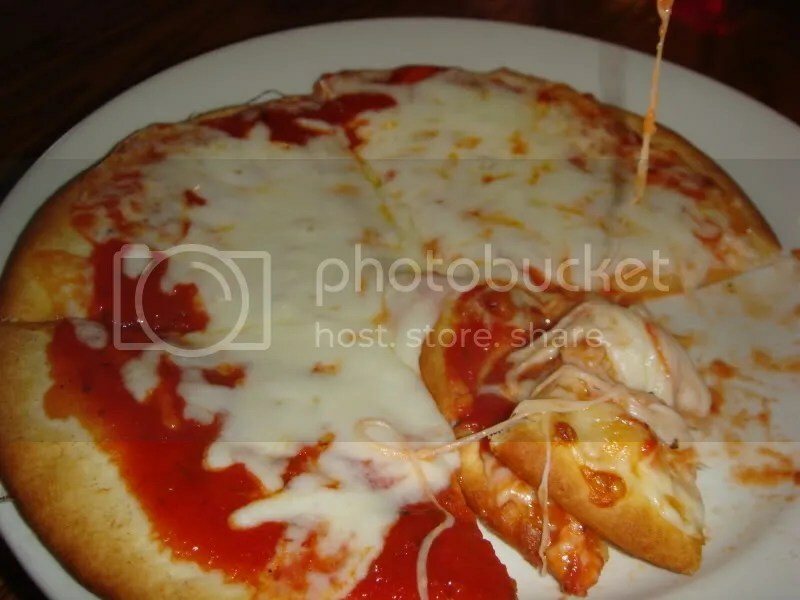 as appetizing. They also have lasagna, spaghetti, manicotti and the like. It is good and served with a salad and grilled garlic bread. The service is normally quick and the owner is friendly. The atmosphere is probably the best in Lincolnton with the buffed hardwood floors, the exposed air ductwork, large picture windows, plants and location to the court house. My only gripe is the parking. It is always, no matter what time I arrive, crazy packed and you feel you’ve won the lottery if you find a space up front. Even if you have to walk a piece, it’s worth it.